Every year Charlie and I escape Chicago’s hustle and bustle for a wine tasting R&R weekend. 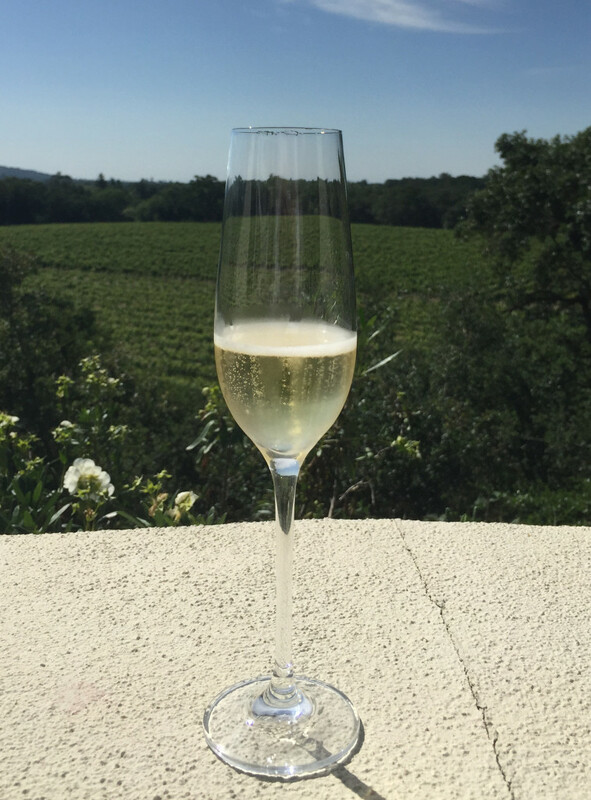 This year we headed to the ever-beautiful Sonoma County, California for our getaway. We spent three glorious days sipping and savoring the very best that Sonoma County had to offer. Our weekend was filled with lush wine, delectable cuisine and picturesque landscapes. Upon reflection, it was a perfect weekend getaway. , Pinot Noir, Cabernet Sauvignon) all sourced on the estate vineyard. What is special about this vineyard is not only the wine, but the exotic botanical garden. The stunning garden has a selection of fine plants, many of them rare that we enjoyed while sipping a glass of bubbly and admiring the superlative views. 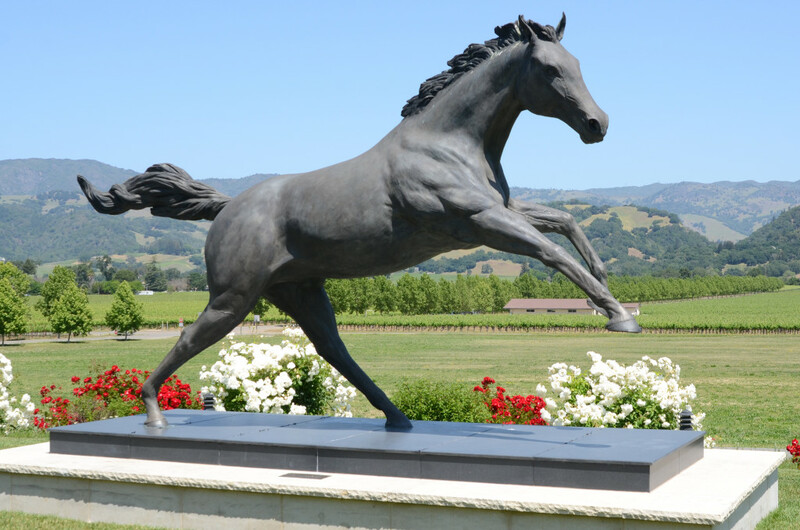 It was the perfect first winery to visit set the tone for our great Sonoma wine weekend. Our first detour was to drink some hops and barley. We (of course) headed to Russian River Brewery in Santa Rosa. 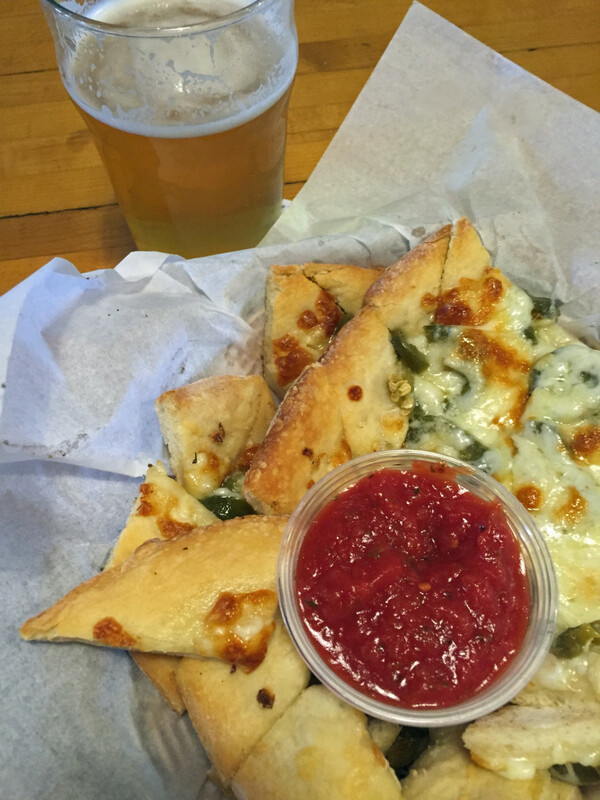 A craft brewery whose made a lasting impact on the industry with their Pliny the Elder, Pliny the Younger and Sour beers, I couldn’t resist washing down some of their spicy pizza bites with a fresh Pliny the Elder. With miles of rugged Pacific coastline and Sonoma’s close proximity to the Russian River, we couldn’t refrain from taking a drive (not after wine tasting! ) and exploring Highway 1, the Pacific Coast Highway and the Russian River. 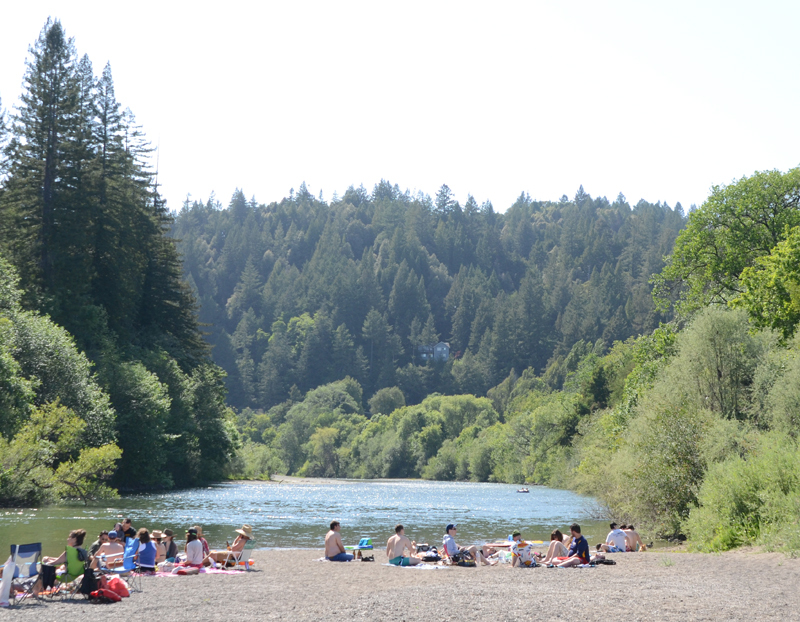 It was a gorgeous day and locals were enjoying the crystal clear river with friends and family. It was a nice break from eating and drinking and the fresh air and clear blue skies were incredible. While we did rest our palates from time to time exploring Sonoma, our weekend was focused on wine. We tasted some great wines at Eric Ross, Muscardini Cellars, Ledson Winery, Stonestreet Winery and St. Francis Winery. However, the highlight of our tastings was at Vérité. 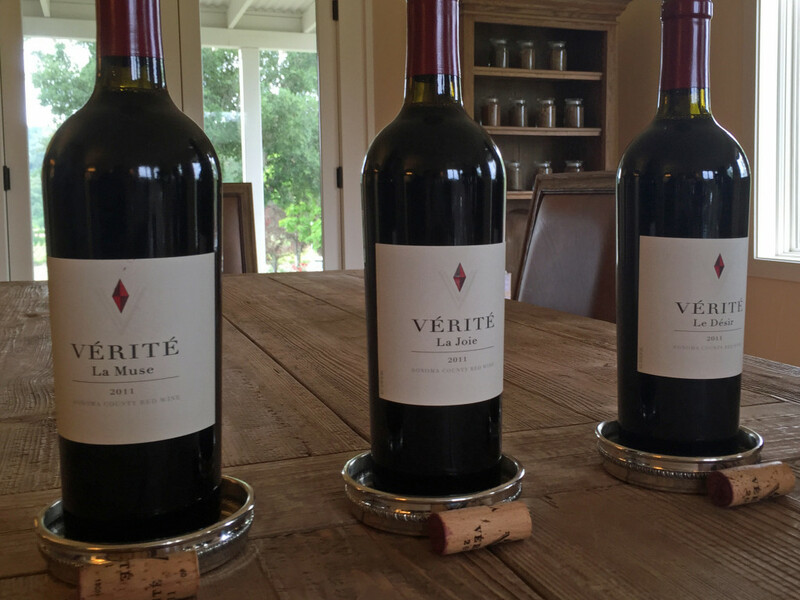 Producing only three wines, Vérité focus on the Merlot grape. Each is exceptional. La Muse, La Joie, and Le Désir, are all beautiful wines and I encourage you to visit to Vigneron Pierre Seillan and his winemaking team to experience them for yourself. In addition to wine we ate some delectable food. Our lunch at Barndiva was divine. The crab salad sandwich was AMAZING. Having eaten a LOT of sandwiches in my lifetime, this one was superb. 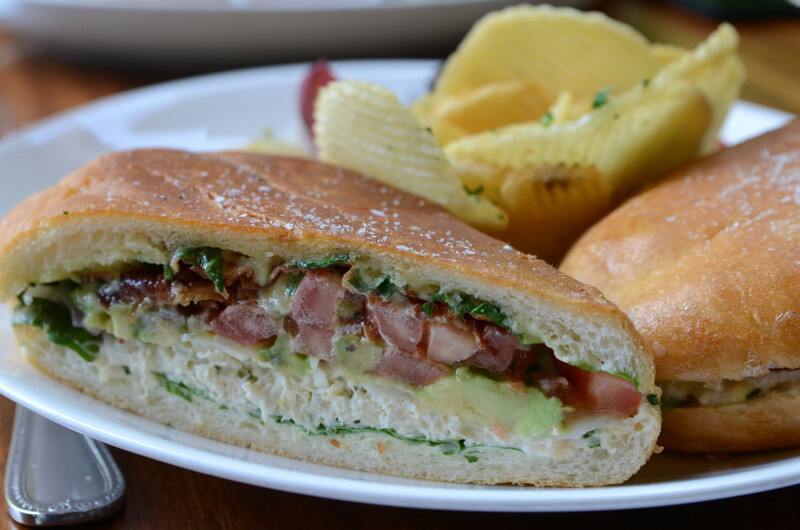 The salty bread with the rich crab and crisp bacon was flavor explosion. I must also mention ZaZu Kitchen & Farm where we had a noteworthy breakfast. Oh, and their bacon and cured meats… heavenly. Go for breakfast then ask to see if they if they have Pliney Sausage and take some home with you with an order of bacon, you will thank me later. 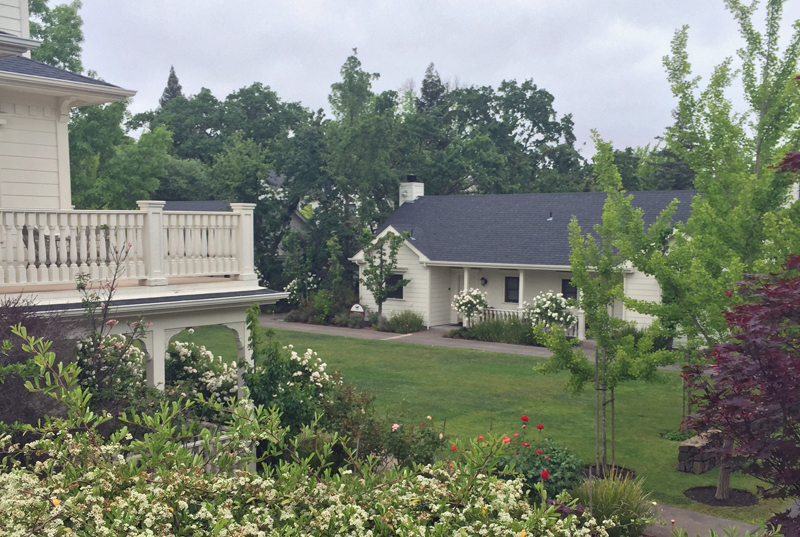 Our trip was made extra special by staying at the beautiful MacArthur Place in the city of Sonoma. The room, lovely, the grounds, gorgeous. Immaculately kept rose gardens were in bloom and they were spectacular. Each time I visit California, I fall deeper in love. Lush wine, delectable cuisine and picturesque landscapes, what is not to love?